Reviewing the Avantree Laptop Table. 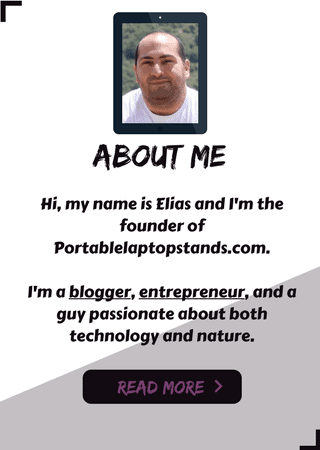 In this review, we are going to focus on the Avantree laptop table and its features, to try and figure out whether it’s the best laptop table for YOU or not. Avantree, actually, is not specialised in anything related to laptops or even laptop stands, tables, or desks. 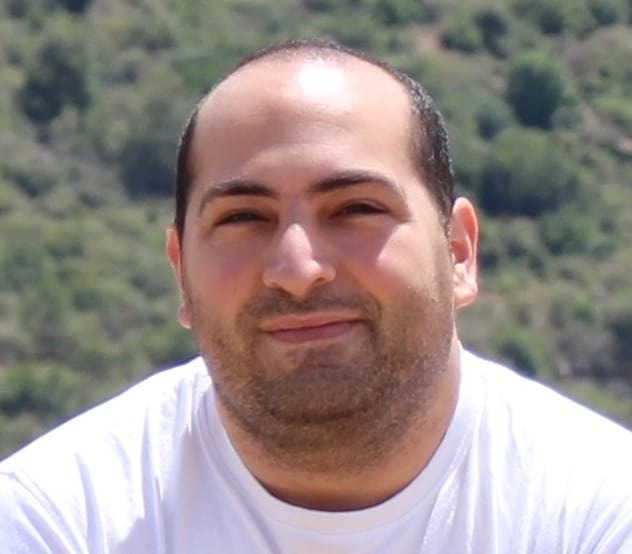 It’s a company focused on developing and manufacturing wireless, Bluetooth audio products and solutions. This is the Avantree Laptop table holding a Mac on its top surface. Click to see what other real customers had to say about it on Amazon. However, these do not make their entire range of products. In fact, in the “Other Products” page you’ll find several products ranging from armbands to hold your cellular phone, to DAC converters and more. But this little sweetheart, I found on Amazon exclusively. I tried to locate it first on their official website. The most logical thing to do was to try searching in the “Other Products” tab. But to my surprise, it was not there! I even clicked on “Products” to browse ALL their products and even there it wasn’t there! I thought to myself … That’s weird. Then I noticed there’s a “Search” field on the top right corner and I said I’ll give it a try. This will be my last resort. So I searched for “Table” and FINALLY, I found it in the search results! I have no idea why they did not list the table in their shop, they could even put it in the “Other Products” category, but at first, it seemed to me that they wanted to focus all of their purchases for that product exclusively to Amazon. The price for the Avantree laptop table found on their official website is the same as the price on Amazon, however, I found that on Amazon you get much more opportunities for discounts and promotional offers so I strongly recommend checking the product there and see if you could catch a last-minute offer (When I last checked there was a 25% OFF discount on Amazon – Which is something close to $10!) and buy on Amazon. Anyways, enough about Avantree, more on the table itself! Avantree Laptop Table Description and Specifications. The company stated that, while you can let your kids play and eat food on it, they designed it for adults in mind. There has been an incident where one kid got her finger stuck in between the folding legs at the point where they should unfold. The folding mechanism got stuck and she was unable to release her finger which resulted in an injury that got her bleeding. The company responded to the incident with an apology and stated that the table is mainly designed for the use adults. 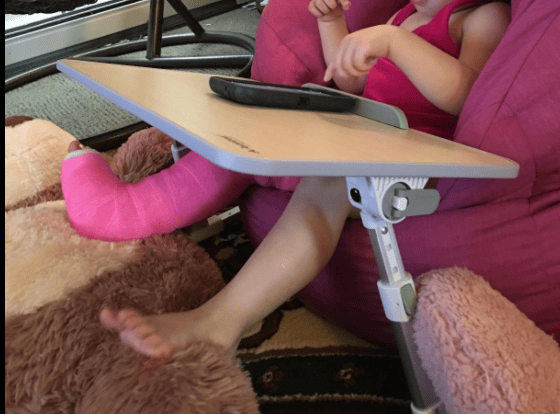 You can still let your kids use it but it is advisable that you keep an eye on them and teach them how to properly use the product, so an incident like this never happens again. A bit wobbly on bed. While the majority of the customers have reported that the table is fairly stable and sturdy, and can be used on many surfaces, including a bed’s surface, there have been very few that reported otherwise. I think this depends on the weight of the object laid on top of it, the aggressiveness of your typing, and even the height adjusted for the table as the highest level could be a bit less stable than the lower levels. Overall, I do still believe that this table is reliable and sturdy enough. They could make it much stronger, sure, but that would come at the expense of weight, which if surpasses a specific number, would turn the table less portable, and thus less functional for what it was designed for. Portability is the most important feature here! A lot of other portable laptop stands have ventilation holes on the surface of the table. Most new laptops nowadays do not need additional external cooling, I’ve had my laptop for 2 years now and I’ve NEVER used an external source of ventilation like USB fans, and I’ve never had any problems with my laptop getting overheated as a result. However, if you have a fairly old laptop and you know that you have a heating problem with it and it crashes or freezes very frequently as a result of this, then this laptop stand maybe would not be the best fit for you. There are whole panels with integrated fans in them that you can buy off Amazon or Aliexpress that you can put it beneath your laptop on top of this laptop desk as an alternative, and they’re not costly at all. They would do the cooling job for you pretty well. TABLE HEIGHT: 5 different heights – From 9.4″ to 12.6″. WARRANTY: Contact the manufacturer for warranty information. This laptop table is very versatile yet very simple. It’s a complete multifunctional workstation and not only for your laptop. Its comfortable ergonomic design, size, weight, and adjustability allow for many, many more uses than a mere stand for your laptop. Food table for your kids, inside and outdoors. A standing desk for office work. And of course, as a portable laptop/tablet table and stand. Let’s discuss features and benefits in more details now, shall we? [ 1 ] Work While Standing. 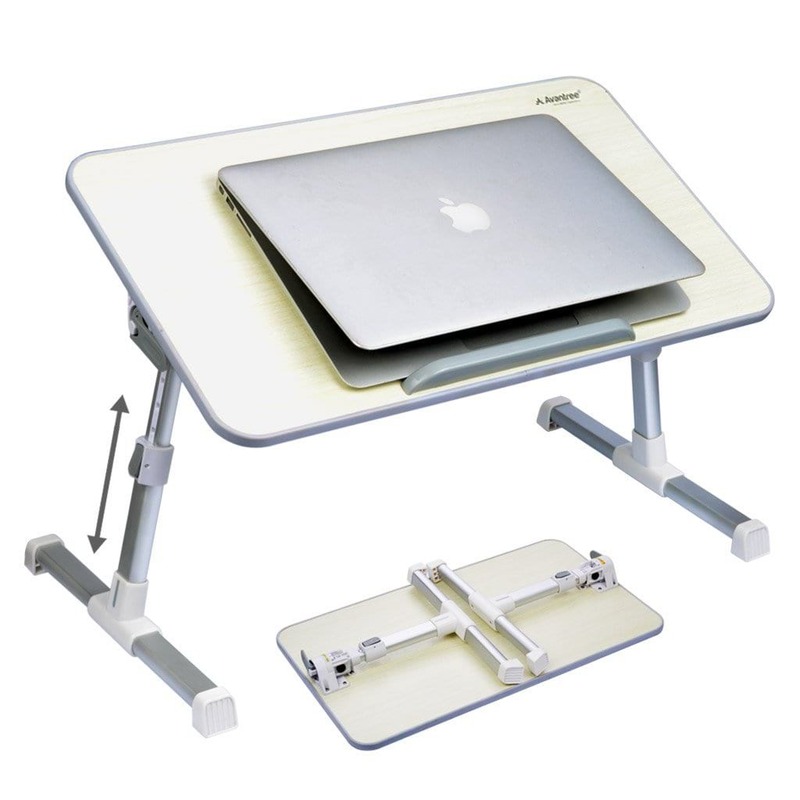 There are many health benefits to using a proper portable, adjustable laptop table like Avantre. Perhaps the most notable one is the usage as a standing workstation. By placing the table on top of your desk at the office, you allow yourself to work while standing up. Reduces the chance for backache. Reduces pain and stiffness of your neck down to the lower back. Enhances blood circulation through the body. 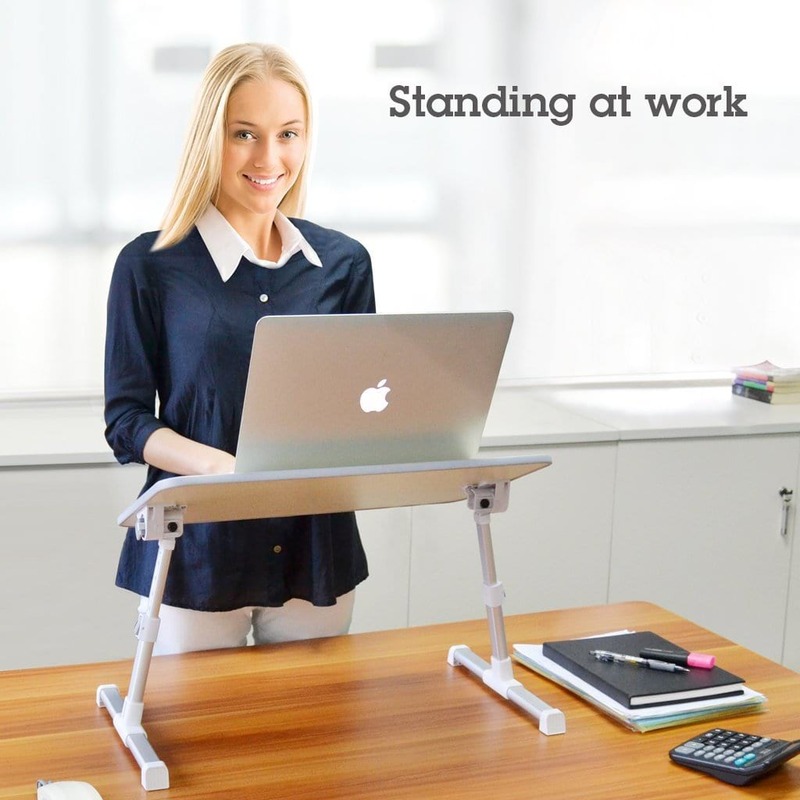 While you can purchase a whole new standing workstation, one of these would easily cost you 10 – 20 times more than this simple table that is also portable and easy to carry, so you can have your standing workstation on any desk you want, anywhere you want. [ 2 ] Snack Tray, Food Table. 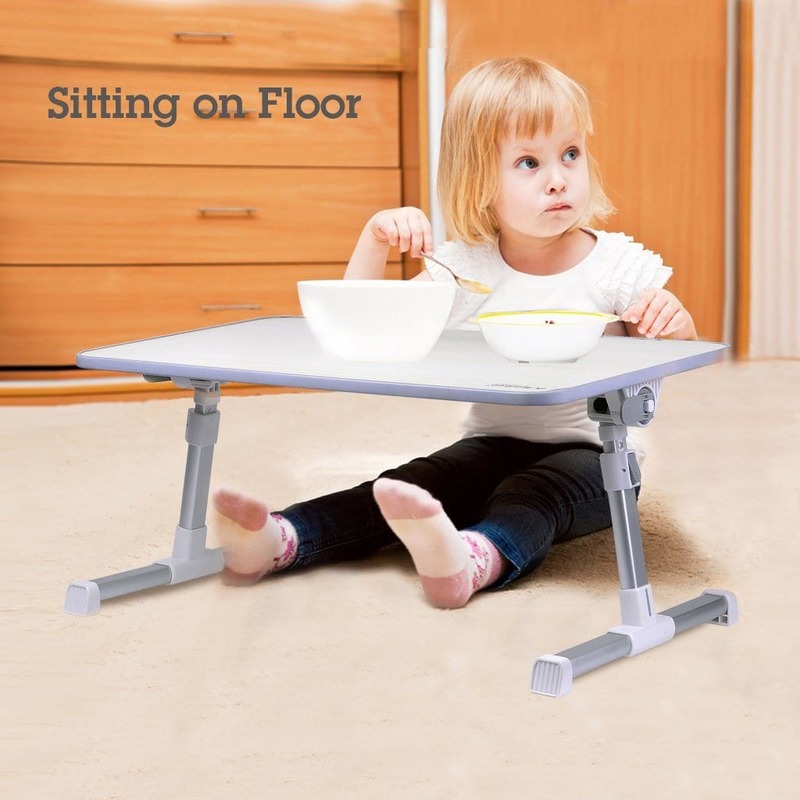 The Avantree laptop table is sturdy and big enough to hold all kinds of snacks and dishes, and as the picture shows, it’s ideal for children and kids as they just love sitting on the floor. IMPORTANT: When using it as a food table, make sure that all the joints are locked and that the table is stable enough to withstand and hold the dishes in a straight line so the food doesn’t split over and leave stains on the floor or your cloths. This table is just very simple, easy to use, and extremely portable. Weighing only 1.5Kg, you can carry it and put it anywhere you like. Do you like working on your laptop in bed? Or maybe in the living room on the sofa? Or do you have to visit some friends or family members but still you want to bring your laptop with you for some networking to pass the time? For me, I wanted a stable, light-weight yet sturdy enough table to hold my laptop while I’m relaxing in bed. And the Avantree portable laptop table is a great choice for just what I need. Not only its lightweight and portability that allow me to do so, but also, it’s made of high-quality wood that makes it very ergonomic, comfortable for touch, environmentally friendly and durable. Additionally, it has protective plastic covers on the edges of its legs where it stands, so that it does not scratch the surface that it’s being laid on. This is very important as, without this addition, it would’ve been extremely difficult to trust it on soft surfaces like on bed sheets, because, the chances that it would scratch and tear into them would be very high, and a lot of customers, rightfully so, would be raging with complaints. [ 4 ] Adjustability and Versatility. When we say adjustable and versatile, we don’t just say it. Avantree laptop table is extremely versatile, and it’s adjustable to certain limits that are enough to be useful for you in many situations and positions. 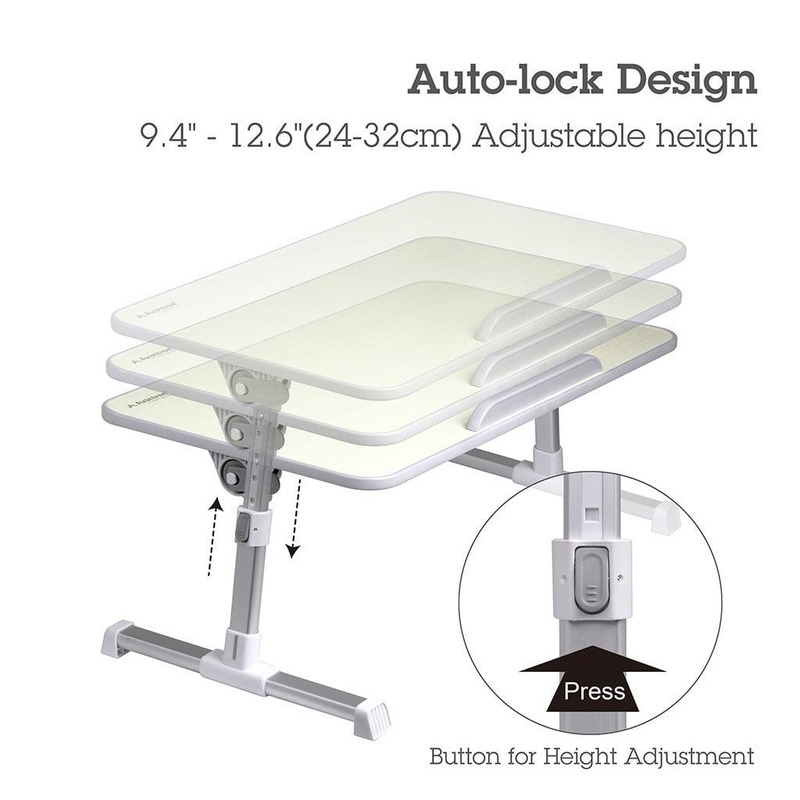 As the illustration shows, the table has an auto-lock design. With a press of a button, you release the lock and allows you to adjust the height up to 12.6″, with a minimum height of just 9.4″. Both height and width are proven to be more than enough to fit a full grown adult comfortable and without any problems. There have been a few concerns by some people whether this laptop table fits their size, more particularly, its width, or the distance between one legs’ side to the other. The distance between the two support legs is around 19″, which is considered pretty wide even for the “larger than normal” adult. 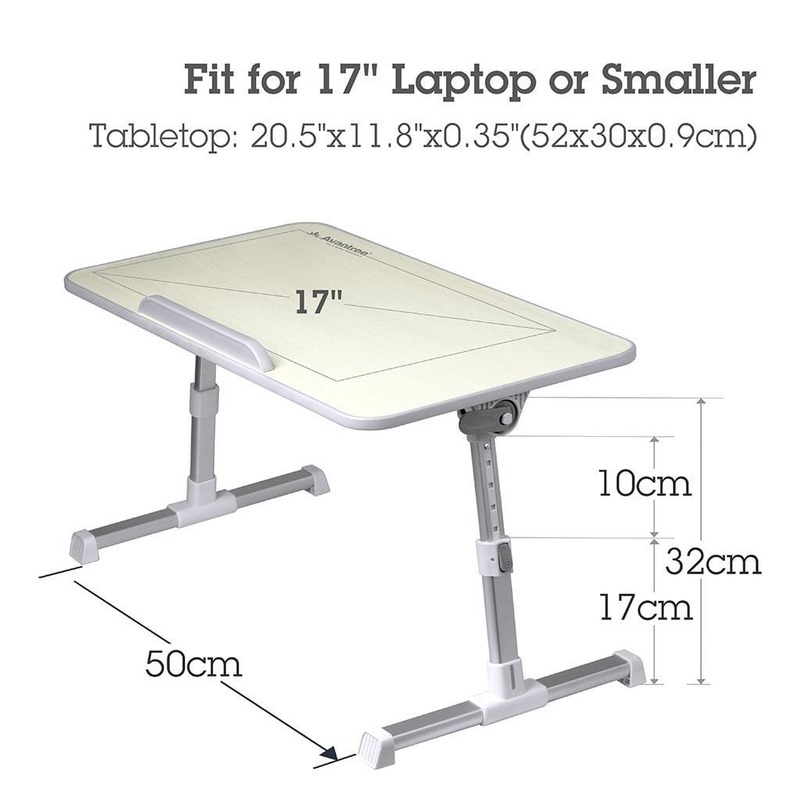 Tabletop Width Fits 17″ Laptops or Smaller. The width of the top surface of the table fits tablets and laptops with a screen size of 17″ or smaller easily. However, if you have a bit bigger laptop, you can purchase the bigger version of this table and you’ll be just fine. 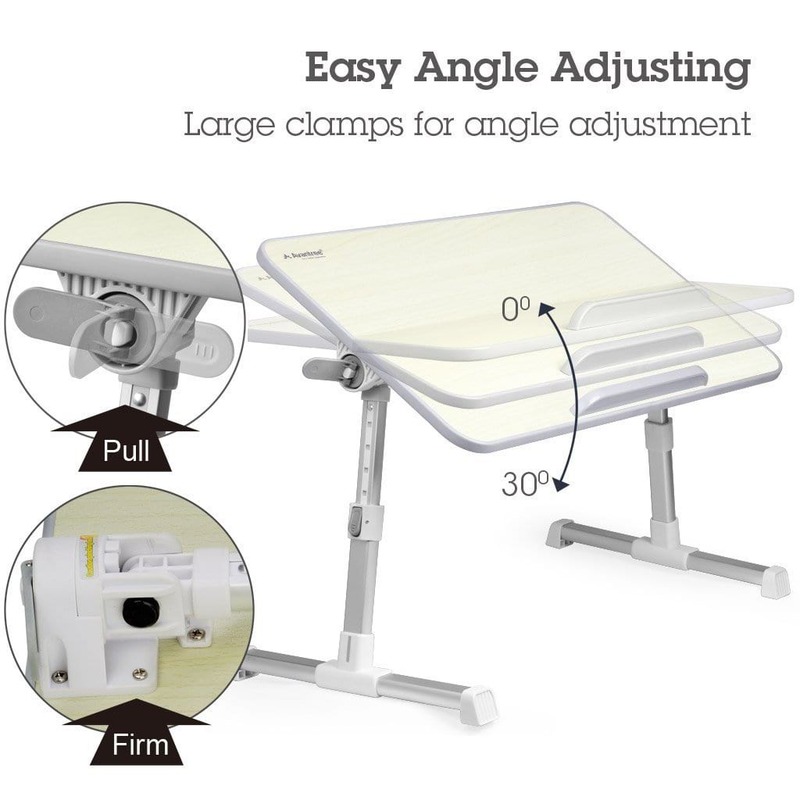 With an angle adjustment of around 30º, you have plenty of room to adjust it to any angle view you want. Just pull the locker button to adjust the angle, and release whenever you are satisfied. I haven’t seen any complaints about locker mechanism failing or instability of the table when adjusted to a certain angle degree, so I’m going to assume that it’s pretty stable and reliable overall. Packaging of the Avantree Laptop Table. 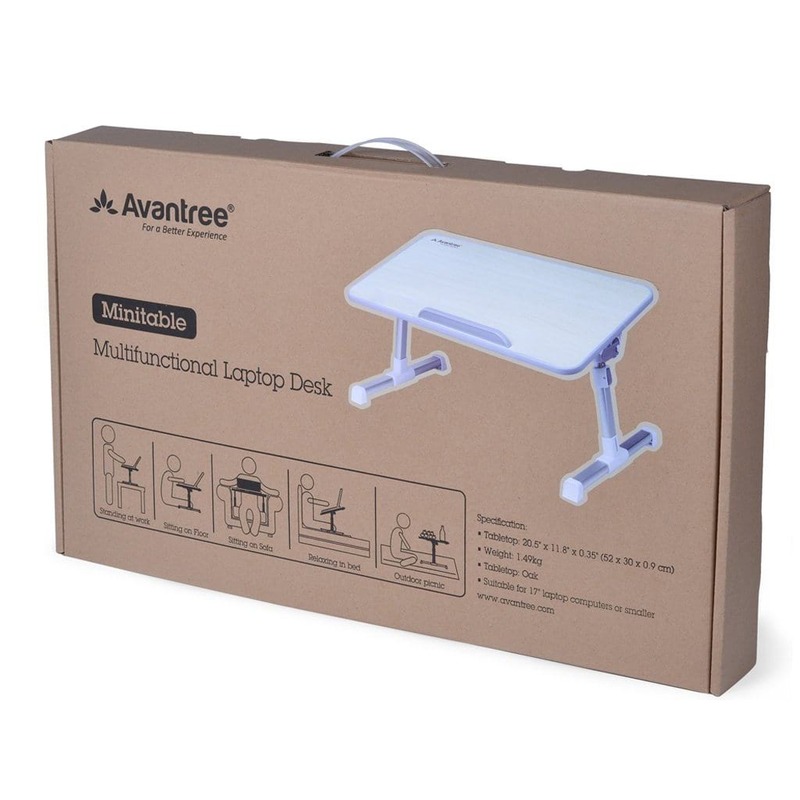 The packaging of the Avantree laptop table is just as the image shows above. Notice: This is the packaging of the small size version of the table – The version we focused on in this review here. The bigger version of the table will have a slightly bigger packaging, and slightly heavier, respectably. It comes in a Kartoon box with a grip handle made of plastic so it’s easier to carry and unbox anywhere you like. It also includes the specification of your product and a few illustrative examples showing you the many positions you can use the table in. The package looks great, clean, and professional to my eyes. So, in conclusion, this Avantree laptop table comes in two versions, the small version (Of this review), and a larger one to fit bigger and heavier laptops. It is safe to say that this Avantree table is sturdy, lightweight, portable, foldable, and very versatile, and can be suited for a variety of purposes and situations. 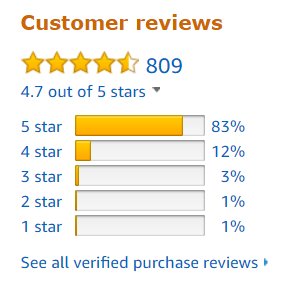 The vast majority of customer reviews came out excellent and the feedback it got from the buying customer is just great. There have been a few issues of stability every now and then, especially on soft surfaces like on bed, but due to the attempt of keeping the table light and portable, the manufacturer couldn’t heavier and more sturdy material to make the table more durable and stronger. So I’d take extra caution in situations like these. Nevertheless, the table is considered to be pretty stable and very easy to carry around, it’s easily foldable so you can more easily move it around, store it under the sofa or your bed, and save a lot of space while in this shape. As of now the price has been ranging between $29 to 39$ on Amazon, and knowing Amazon from a long time ago, I’d keep a close eye on the price because a lot of times they offer discounts on special holiday seasons and events.